Broadcasting & Cable (B&C) is a business-to-business brand intended for individuals with broad-based interests in the television, broadcast, cable and program syndication industries. It could be good news or bad news for newspapers, depending on just how low your expectations were at the outset. In an age when one of the U.S. President's top advisors has openly declared the mainstream news media to be "the enemy," it won't come as a surprise that the American public's overall trust in newspapers is remarkably low. But at least it's higher than it used to be. According to Gallup, the proportion of Americans who have a "great deal" or "quite a lot" of confidence in newspapers is 27%, which is abysmally low by historic standards – but up noticeably from last year, when it bottomed out at 20%. 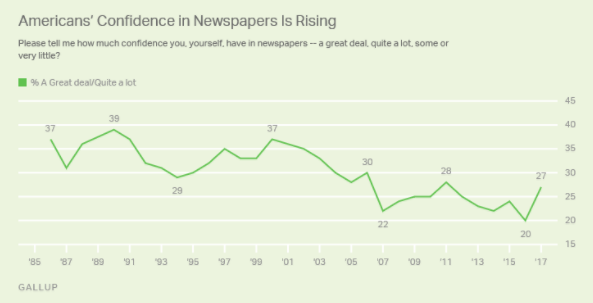 For long-term perspective, back in the glory days of 1990, 39% of Americans said they had a lot of confidence in newspapers, according to Gallup. Although there have been ups and downs over the intervening decades, the general trend has clearly been downwards. Those smaller variations make it impossible to tell whether the trend has finally reached an inflection point. Or, if we're just bouncing along the bottom, trying to interpret the results in the light of recent events. For example, it seems reasonable to hypothesize that last year's low was correlated with the 2016 presidential election. It possibly reflected Trump supporters' disapproval of newspapers' overwhelming – and very open – opposition to his candidacy. But nothing that has happened since then would explain any change in their attitudes. That suggests the shift is occurring on the other end of the political spectrum. Hard lefties are re-embracing newspapers they once dismissed as corporate tools. Indeed, the data supports that theory, as the proportion of self-identified Democrats expressing a lot of trust in newspapers rose from 28% last year to 46% this year. The proportion among Republicans sank from 16% to 13% over the same period. While it is an open question whether becoming partisan mouthpieces is a good long-term strategy – let alone a fulfillment of their historical mission – newspaper publishers can console themselves on one point. They are considered slightly more trustworthy than some of their peers. Just 24% of Americans say they have a lot of confidence in TV news, according to Gallup. That's up from 18% in 2014. More magazine brands are producing video as audience rates grow across various platforms, according to the latest Magazine Media 360° Brand Audience Report for May 2017 from The Association of Magazine Media. Video audiences have risen 48.1% from May 2016 to May 2017. There are now 82 magazine brands that report a video audience to MPA. Its reports include 126 magazine media brands from 30 companies, representing 95% of magazine readership. In the May 2016 Brand Audience Report, only 68 brands could report a video audience, which means the number has gone up 21%. Video audiences are defined in the report as unique viewers who watched a video at least once through a player owned or operated by the publisher and/or through a clearly branded video channel. The content categories with greatest growth in video are health, travel, women's fashion and beauty, and upscale shelter. Total magazine media audience – across print, web, mobile web and video – is up 2.3% in May 2017. That's compared to the same month a year ago, according to the recent MPA report. The audience numbers for each platform are consistent with trends in recent months. Both print and video platforms show growth compared to last year, while web audiences continue to decline as audiences shift to other platforms. 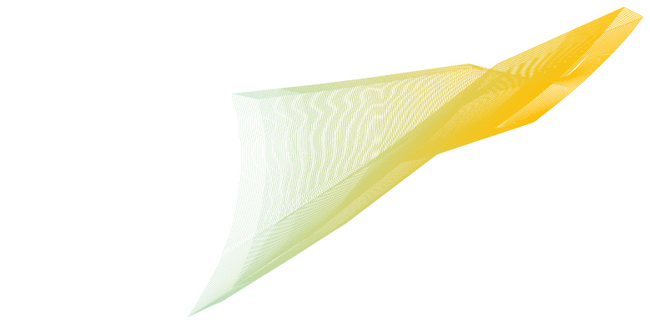 The mobile web has flattened. In the recent report, which includes print readers and digital visitors that consume electronic issues of a publication, such as an e-reader or app, numbers are up 3.7%. Web audiences on a desktop or laptop are down 9%, while mobile audiences – unique visitors that visit a site on a mobile device – are up 1.4%. Content categories with above-average print and digital audience growth this month are upscale shelter, travel, adventure outdoor, and science and technology. The top five magazine brands with the most total audience for May 2017 were ESPN The Magazine, People, Forbes, WebMD, and Better Homes and Gardens. The magazine brands with the greatest percentage growth in total audience for May 2017 compared to a year ago, were W, Nylon, Money, The Atlantic and Teen Vogue. An Audit Workbook should be submitted at the conclusion of each audit period (see due dates below). The workbook details your publication's distribution for each issue and average circulation for the report period. 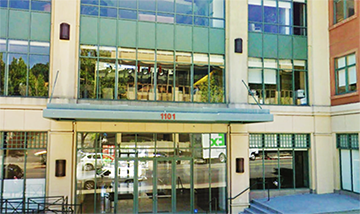 If you have any questions about workbook filing dates, please contact Verified at 415-461-6006.